Click "Buy Now" to proceed to checkout. 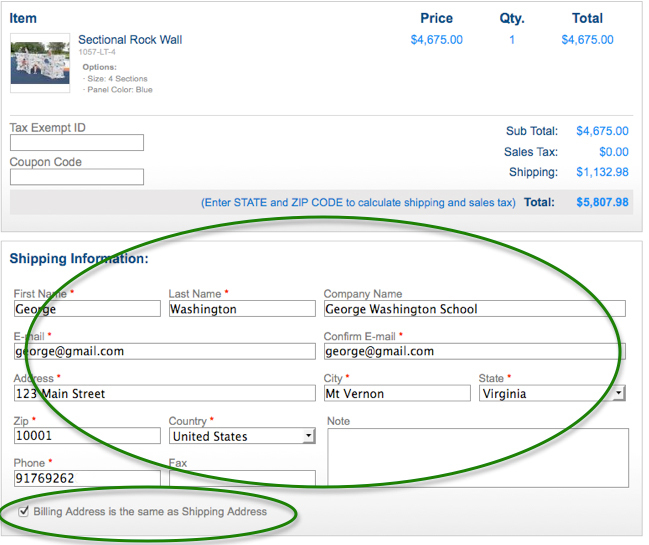 Check the "Billing Address is the same as Shipping Address" box for simplicity. You will not be purchasing the items. Now, submit your request to BYO Recreation and your form to ClassWish so we can purchase these items for you. You must do two things to submit your request. Verify the items in the shopping cart and the shipping address of your school. In the Select Payment section, choose the "Check" option as seen circled in green in the image to the right. In the "Name" line please enter your name and ClassWish ID. Your ID# appears within the URL of your Wish List page if you do not know it. 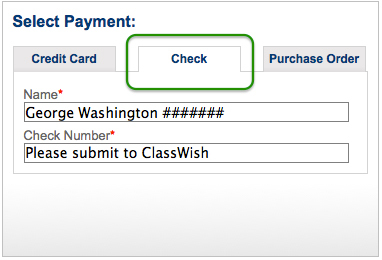 In the "Check Number" line please just enter "Please submit to ClassWish". Click "Checkout" to proceed and submit your shopping request. B. Please complete and submit this form to ClassWish. BYO Recreation will contact us with your request. We will pay BYO Recreation for the request you have submitted. BYO Recreation will ship the materials to you at your school.